Your vacation object: The Holiday apartment is located on a an open property. In the same house there are holiday apartments DAL PAR 121 (5 persons), DAL PAR 122 (4 persons), DAL PAR 123 (6 persons) and DAL PAR 124 (6 persons). The owner lives permanently in the house or, but uses a separate entrance. Your holiday apartment: Your holiday apartment offers 1 floor, 3 rooms (from which 2 bedrooms), is 65 sqm and can accommodate up to 6 persons. An air conditioning ensures pleasant temperatures on hot days. The entrance is on the 1st floor and leads over 10 steps and an internal stair directly in the kitchen living. 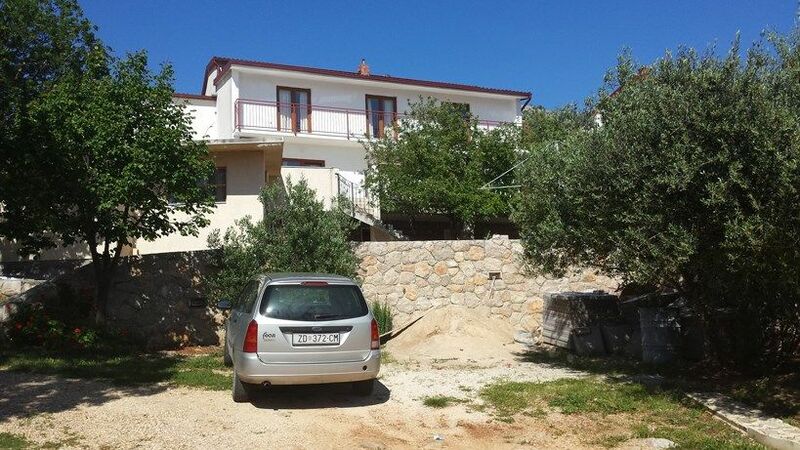 The rooms are divided as follows:Higher ground floor: Bedroom 16 sqm and with 1 double bed and dinette. You have access to the covered balcony with garden furniture, 1 table and 6 chairs. Bathroom 5 sqm and with bathtub with shower, 1 washbasin and WC.1st floor: eat-in kitchen 15 sqm and with 1 additional bed, dinette and TV. The dinette offers space for 6 persons. Bedroom 9 sqm and with 2 single beds and dinette. Cooking nook as intersecting room, 5 sqm and with dinette, electric cooker (2 plates) and refrigerator (50 l, freezer). Bathroom 5 sqm and with shower, 1 washbasin and WC. In addition, your holiday apartment is equipped with WLAN- internet access. TV or radio channel can be received per satellite. Pets: nicht erlaubt. higher ground floor: bathroom (5 sqm) with bathtub with shower facilities, 1 washbasin and WC. 1st floor: bathroom (5 sqm) with shower, 1 washbasin and WC.